Greetings friends and fellow crafters. 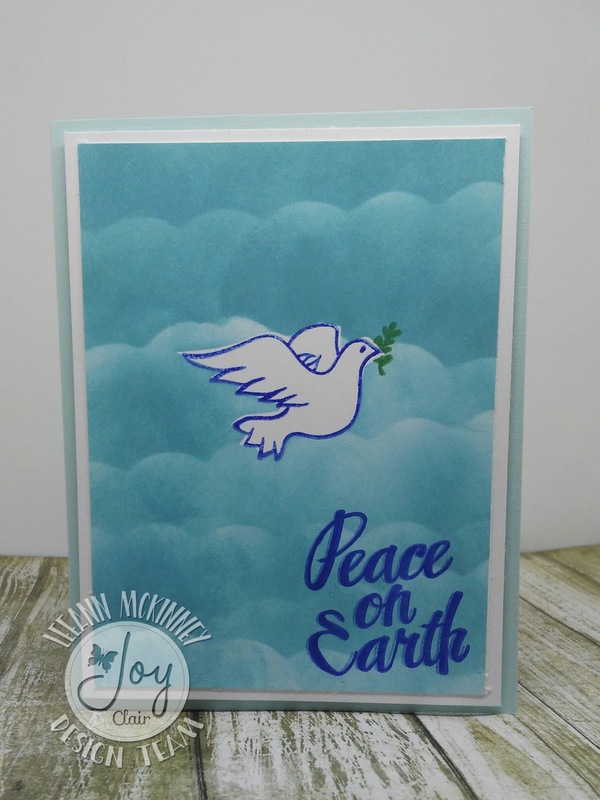 LeeAnn here and today I am presenting a project for Joy Clair that I made using the Born is the King stamp set from the November 2017 release. In making this project I first used StazOn Hydrangea Blue Ink to stamp out the dove first on the Recollections 110 lb cardstock I used as my base, but also on clear repositional contact paper. I fussy cut the dove in the contact paper to use as a mask and attached it over the doc on the cardstock. I then found a scalloped stencil in my stash and grabbed my Summer Sky Memento Dew Drop. Using a blending tool I inked up my page slowly moving the stencil down starting at the top. Once I had that part complete I removed the contact paper mask to reveal my un-inked beautiful white dove. Using that same Hydrangea Blue StazOn ink I stamped the sentiment. I mounted this panel on an A2 card base using foam dots and this project was complete. Thank you for joining us and don't forget to follow on our social media venues to be the first to hear the news about sales, promotions and giveaways!